We hadn’t had a grubcrawl in an age so it seemed about time to sort that. With regulars Liz, Andrew and Mairi joining first timers Anna, Gerald and Shaun we set sail for starters, main courses and desserts in three different city centre venues. First up was Italian wine cafe Veeno on Rose Street. It was my first visit so when the troops looked to me for counsel I didn’t have much to offer. I turned things over to our charming waiter who steered us assuredly. 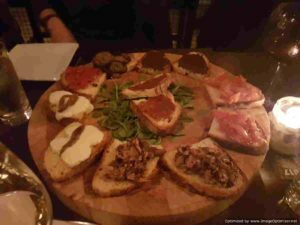 We matched a bottle of Amarone with a sharing platters of meat and cheese plus a selection of bruschetta. I opted for a flight of white wines because it seemed like a good plan. The platters arrived on thick wooden rounds looking generous of portion and stylish of presentation. The bruschetta selection offered tomato, aubergine, tuna, black olive, nduja, and anchovy-topped cheese varieties. All were to a pleasing standard. The meat and cheese platter was a notch better with a good range of different items to nibble on. The bresaola was of particularly good quality. Veeno isn’t packing them in as yet. It strikes me as a tough location for what they are doing. The only niggle we had with the place was the absurd black cage work of the interior design which evoked modish burger joint rather than sleek wine bar. But that aside, it’s definitely a place worth checking out. The bill came to £126.50 (there was a chunky discount on the red wine as they were having some issues with their list that meant their top-end stuff was being charged at a mid-price level, that night) which we promptly paid and were on our way. The walk between courses was perhaps just a little shorter than it should have been. The platters had been substantial and a stroll to walk off the excess would have brought great benefit. Alas, Meze Meze was barely fifty yards away, but on a chilly night that had its upsides. 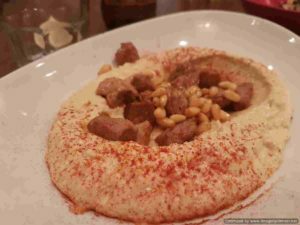 I’d previously visited Meze Meze for a quick lunch and been a bit underwhelmed, but I’d heard much more favourable reports since then. 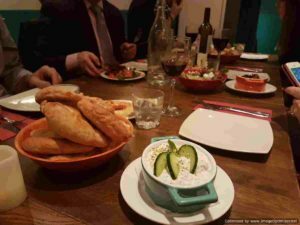 Their sharing meze dishes struck me as a good grubcrawl fit. The place has a slightly odd array of decorative detailing with many of the antique signs evoking Paris cafes rather than Istanbul tea rooms. This is somewhat mirrored in the menu which has a few outliers mixed in with more recognisably Turkish dishes. We collectively agreed that two dishes each would be enough given what we already had in our bellies. Towards my end of the table we saw tzatziki, hummus with lamb, red pepper ezme, sucuk, Greek salad, complimentary patatas bravas and bread, and baba ghanoush. The ezme wasn’t the best I’ve had but everything else was to an agreeably good standard. Portions were very generous with the dips almost endless in their supply. The bread was warm and fresh. 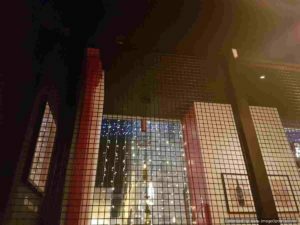 This bill came to the similar figure of £122.21 – more modest wine with a little more food – which kept the restaurant maths relatively simple. At this point our numbers dwindled as some were full from two monstrous courses while others had families that needed attention. The dedicated few headed onwards to the Auld Reekie Tiki Bar, which again was just a few short steps away. They do offer a fruity and zesty dessert menu but we decided that we could easily obtain such flavours through the ordering of daiquiris. This included sampling the excellent Sea Wolf white rum produced by the chaps from Bramble. Reekie Tiki is a fun place. 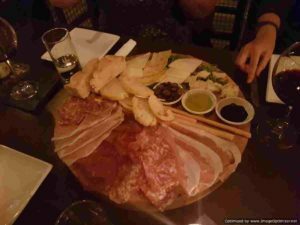 We reviewed the food a couple of months ago and have since been back for fairly regular visits for a cocktail or two. 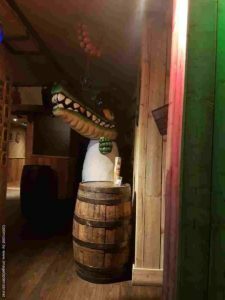 With its tiki hut interior and relaxed vibe, it’s a place worth noting for December as its ample confines and engaging menu could be a good fit for work nights out. So overall, it was lovely to get back on the grubcrawl trail. This one was a good balance between the new and familiar for me. We probably over-exerted ourselves food-wise at the first stop but that was no bad thing as Veeno served us some high quality items. I’d definitely return to Meze Meze, and Reekie Tiki can rest assured that I’ll be back for more fun cocktails.